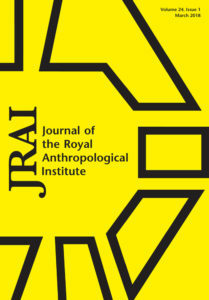 The Journal of the Royal Anthropological Institute is the principal journal of the oldest anthropological organization in the world. It has attracted and inspired some of the world’s greatest thinkers. International in scope, it presents accessible papers aimed at a broad anthropological readership. Articles, at the forefront of the discipline, range across the full spectrum of anthropology, embracing all fields and areas of inquiry – from sociocultural, biological, and archaeological, to medical, material and visual. The JRAI is also acclaimed for its extensive book review section, and it publishes a bibliography of books received.